1 CPAP Machine – Which Option Works Best For You? 4 CPAP Machines – Do They Really Have A 100% Success Rate? CPAP Machine – Which Option Works Best For You? A CPAP machine is a device worn over the mouth or the nose during sleep, allowing sleep apnoea suffers to get sufficient oxygen flow, and air through the passages during the night. With continuous air pressure flow, not only do these machines allow sufferers to breathe easy at night, they will help sufferers who sometimes go minutes at a time, without being able to properly breathe at night. Regardless of the severity of your condition, the right CPAP machine can provide relief, and is a solution for many who would otherwise consider having surgical procedures completed for this condition. Auto adjusting machines (known as APAP) have the ability to allow users to properly adjust the amount of air they receive, and continuous pressure received, when worn at night. Similar to standard machines, the main difference is that users can adjust the amount of air flow with these machines. When the machine detects more pressure is required to sustain air flow, it will automatically adjust for you, so as to ensure you can breathe easy at night. Due to the fact that during the course of the night we enter different stages of sleep, sometimes more pressure is required. If this is the case for a particular sufferer, this machine will automatically detect it, and adjust to ensure you receive sufficient levels of air flow. It allows for auto adjustment. If you are not getting enough air pressure, it will ramp up, to ensure you do. It detects whether or not you are getting sufficient air pressure. They properly adjust during the course of the evening to ensure proper air pressure and flow by the sufferer. Ranges can be adjusted, meaning a minimum pressure can be set to max, for sufferers who have a more severe condition. With the auto adjustment, you never have to worry about not getting enough air passing through the passages when you sleep. Further, you can have the machine adjusted for your specific needs, when you visit your doctor or sleep professional who gives you this mask. They do not take sleep position into consideration. This means sometimes you might not require additional air flow, but the machine detects it simply because you change positions during the night. They have to be adjusted. Yes, they are auto once set; but, you need to have them adjusted by a professional, so that the right levels of air pressure are attained. You do have to visit a lab every one or two years to have them readjusted to proper air pressure settings. Although the drawbacks seem to be a minimum, they are some things to keep in mind if you are considering this, as opposed to a standard CPAP machine for night time sleep relief. For CPAP machine users, if you are considering the switch over to an auto CPAP machine, there are a number of models and options to consider. Which one will work best for you? How will it work? Is it a comfortable fit? These are some of the questions which will be answered. These are a few basic facts about some of the best CPAP machines you can find when you have chosen to purchase an auto machine. The acronym CPAP stands for Continuous Positive Airflow Pressure. Use of a CPAP machine is the most common treatment for moderate or severe cases of sleep apnoea. For the sleep apnoea sufferer, using a CPAP machine can be a difficult process to come to terms with, as it is something that will need to be incorporated into your lifestyle and a period of adjustment will be a little uncomfortable until the right settings for the individual can be found. Wearing the mask that attached to the machine can be distressing and feel a little claustrophobic. It can be difficult to get used to and very frustrating learning how to relax and adapt your sleeping position so the mask does not fall off. Some sufferers of complex sleep apnoea may sometimes rip the mask off when they become aware of a breathing interruption. This sometimes -frightening condition combined with getting used to the equipment and possibly a new drug regime, is a big adjustment to make. It can be distressing for family members as well and children may be scared of the CPAP. It should be explained to young ones very carefully and sympathetically why their loved ones need to wear something that covers their face and makes a funny noise. There will be times when using the machine will seem harder than suffering the sleep apnoea condition but it is vital to persevere and do what you need to do to make the treatment work. Mask issues can be rectified and it is worth trying different types until one is found that is comfortable for the wearer. It will take time to optimise the correct pressure and to get used to sleeping with the machine. If there seems to be no relief from using the CPAP machine, it may an issue with medication that has been prescribed. A lot of support and understanding will be needed from friends and family in the early days of adjusting to this new lifestyle change. There may be several adjustments made to the CPAP machine and medication before the right level is found to suit the individual. Over time, using the CPAP will really make a difference and give back quality of life. There are two different types of CPAP machines used for treating the condition a standard machine and an automatic machine. A standard CPAP device delivers a preset prescribed pressure all night irrespective of a patient’s specific needs. On the other hand, an automatic CPAP machine varies within a pressure range and detects limitations of different kinds in the patient’s airway flow such as apnoeas, snoring and hypopnoea. The machine then responds by regulating the airflow. There is a bi-level option with some CPAP machines, which are suited to patients who have other respiratory problems that make it difficult for them to exhale against the incoming air flow from the CPAP device. These bi-level devices are also suitable where an especially high-pressure flow is prescribed for a particular patient. It is well worth doing a CPAP machine review by researching on line and consulting with suppliers and your health carers to see which option is right for you. Most devices increase incrementally so that the patient can fall asleep in some comfort before the machine starts to operate at its appropriate pressure flow level. The airflow pressure gradually builds up to its operating capacity over a period – usually no more than 45 minutes. 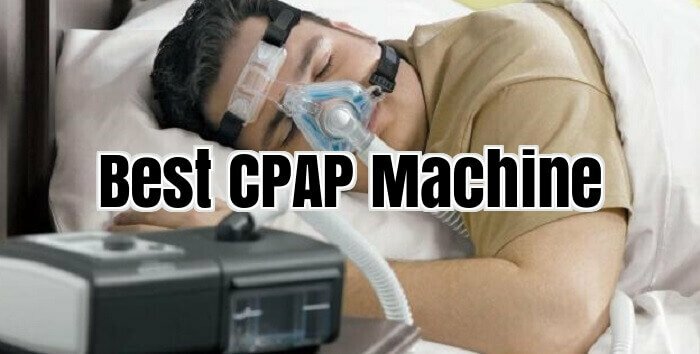 The sound of the machine is a little disturbing to some people, but more modern CPAP machines are very quiet. The noise is only the sound of air whooshing through the tube from the machine to the mask but there can also be noise from the motor in the device. This is also something that takes a while to adjust to if you normally have a very quiet bedroom. Data is recorded from the machine while it is in use including basic details such as hours used and also detailed records of events and pressure data that can be interpreted by medical and engineering personnel when adjusting the machine. For travelling purposes, most CPAP machines are extremely portable and have a suitable carrying case, which means it can be taken with you on holidays, and if travelling overnight somewhere. The most important thing to remember is that the sometimes difficult adjustment to using the CPAP is well worth it for the quality of life you will have when things are settled down. More and more CPAP machines feature humidifiers. This is one of many changes which have been implemented in the design of the machine over the past two decades intended to make the treatment more comfortable for more patients. Other changes have included reduction in size and noise output of the equipment. In fact, CPAP machines do not require the humidifier and the devices can treat sleep apnoea just as well without one. But it does make a difference in that some people struggle to get used to CPAP treatment. Indeed, in some patients the humble humidifier can be the difference between successful and failed treatment. Of course, the other changes like smaller, quieter machines have helped patients get used to the treatment as well. Humidifiers were first introduced to CPAP machines because conventional devices tended to dry out the nasal passages and throats of patients. The continuous flow of air which is passed through the windpipe whilst the patient sleeps used to dry out the nasal passage and the throat. For this reason, patients frequently suffered sore throats and even nose bleeds. A humidifier ensures that the air passed through the windpipe does not become too dry. CPAP machines with humidifiers feature a tank of water. As the air passes over the surface of the water, it collects water droplets and becomes humid. In order to maximise the amount of water that evaporates, the water tanks tend to either have a large, shallow shape to maximise surface area or heat the water slightly to encourage evaporation. Some people mistakenly believe that humidifiers blow warmer air into the throat. Although it may feel this way, this is not strictly true. This is because humidity gives air the feeling of being warmer. Even though humidifiers aren’t necessary for CPAP machines to work, they do make a difference. Despite all of the success stories associated with CPAP, its major downfall is that many patients find it hard to get used to. A simple humidifier is well worth it if it makes the difference between success and failure of the treatment. CPAP Machines – Do They Really Have A 100% Success Rate? CPAP is an abbreviation for Continuous Positive Airway Pressure and is by far the most preferred method when it comes to trying to cure snoring. This CPAP machine stops one from snoring and is a good prevention for sleep apnoea. In this method of treatment, a pressurized mask is worn over your nasal area whilst you are sleeping. On the mask is a miniature pump, which pumps air into your airway, and as a result of the constant airflow, your airway is permanently open. Doctors around the world like to use this method of treatment, but as for the patient, it is not the most comfortable of methods. With regards to the CPAP machine, it is very important to realize the fact that it does not take over your bodies breathing function, but rather just keeps the airways open and clear when you inhale. At this day in age, this method of treatment is the most “non-protruding” method of them all. An otolaryngologist would be the right person to determine if this is the right method for you, and if the doctor finds that it is, you could wear the mask for the rest of your life. Although this treatment does not only include wearing a mask when you sleep, one will have to incorporate a serious exercise routine into their everyday lives, they would have to do whatever they can do to lose weight, and quitting smoking is highly recommended. All these aspects will eventually help you to overcome your snoring problem once and for all. Many people are willing to try a CPAP machine as a method of treatment, because of its effective similar treatment that was made before this, tracheotomy. This basically means that a doctor would perform a surgery, and in this surgery the doctor would make a hole in the windpipe in order for it to be permanently open. The most popular and attractive fact about CPAP, is that it has a 100% success rate, and can be implemented without having to go for surgery. There is one extremely important fact that everyone should keep in mind with regards to CPAP, it is not a permanent cure for snoring, but on the other hand surgery is. Simply put, you will stop snoring when you are using the mask, but as soon as it is off, the snoring will return, surgery will permanently fix the problem. The most common problem when it comes to using the CPAP method of treatment is that it can be a huge irritation and inconvenience when one is travelling, wearing the mask can also form a problem for those that suffer from claustrophobia. A CPAP machine or Continuous Positive Airway Pressure machine is an effective snoring or obstructive sleep apnoea treatment where a user can sleep soundly and have a good night’s sleep. This sleep apnoea machine can also bring comfort to his partner, experiencing sound sleep without the harrowing experience of being up all night because of the loud snore. Although this is not a treatment, in medical language, but it can be of great help to persons having this sleep problems. It is not a cure, but it can help control snoring, and prevent future health problems because of not getting enough sleep. It is a small device that blows air into the user’s airways with enough pressure to keep airways open. The principle behind this is that the air pressure will not let the tongue to fall back into the throat and the throat muscles will not collapse. This will prevent the user from snoring. A mask is fitted on the face and air is fed into the nose through a hose connected to the sleep apnoea machine. As air is swallowed when the mouth is open, the user is forced to breathe through the nose. A person sleeping and breathing through the nose, snoring is lessened while when one sleeps with mouth open and breathing through it, snoring will occur. The use of this machine can improve the quality of a person’s sleeping patterns, reducing the number of times that he wakes up because of snoring and thereby preventing further deterioration of health. Lack of sleep can lead to many future health concerns. When a person wears this equipment, he can sleep for seven to eight hours without any disturbance. Discomfort to his or her partner will also be minimized and help avoid future conflicts because of sleeping concerns. Difficulty in the use of this equipment may be observed during the first few days of use. The hose attached to it and the mask may bring some awkwardness or discomfort during the first few days of use, but may become adjusted after days of usage. Sleeping with a mask on your face and straps on the head may be a source of disturbance during the first usage but you will just get used to it. The most important thing is that sleep patterns are back to normal and no health problems to face because of sleep. This sleep apnoea machine can be sent to what suits a user and the pressure at which the air is delivered can be adjusted. This will bring more comfort to the user. Cleaning the machine and its various parts, like the hose and mask, have to be done because of obvious reasons. Clean air has to be delivered into a user’s body, and having the machine’s parts clean and sanitized is necessary. Sleep apnoea is a condition that can be fatal, especially if you just tolerate this. The mere fact that apnoea means stopping of breath should tell you how potentially dangerous this condition is. What is very unfortunate about this is that the breathing stoppage can occur while you are asleep. Therefore, you are most vulnerable at a time when you are unaware. Many people suffer this condition and they have sought various means of solving this. One of the most common is the use of the sleep apnoea machine, which others may call as the CPAP, or the continuous positive airway pressure. As its name implies, this device ensures that your airway pressure remains favourable to regular breathing while you are asleep at night. The most immediate effect you will notice is that you will no longer snore when you use this machine. With regular and stable breathing all through the night, you can expect to sleep better and be well-rested enough to take on the tasks of the next day. The sleep apnoea machine also happens to be the safest and easiest means for combating the condition. There are other methods that can be used to treat sleep apnoea. However, a number of these are not very effective while those that are also requires complicated procedures such as surgeries and other invasive operation. Of course, if you want to be safe, the CPAP is a wise option. Despite its many advantages though, the machine or the CPAP also has its minus points. You may have to consider knowing these too so that you can make a prudent decision about buying it or not. One negative aspect is inconvenience. You cannot just hop to bed and sleep with CPAP you have to spend several minutes putting on the device in the correct manner. Of course, taking it off will take several minutes again in the morning. Comfort is another thing that you have to give up when you go to sleep with a CPAP on your face. This is the reason that people with sleep apnoea have to learn other safer methods that they can use alternately with the machine.